This European village of Aiguines is situated on a mountain side at the west end of the Grand Canyon du Verdon in France. The village of Aiguines is a local tourist stop for vacationers that come to see the Verdon Gorge in France. This quaint little village sits on the side of the mountain and provides a picturesque view of Lac de Sainte Croix. The houses throughout the village are grouped together in a tight space and consist of older styled homes that have been restored. Beech and oak forest covers the hills and mountains which once made this village a profitable wood-turning industry. While touring the Verdon Gorge be sure to stop in the village of Aiguines for some rock climbing, hiking or for some outstanding scenic photos of Lac de Sainte Croix. 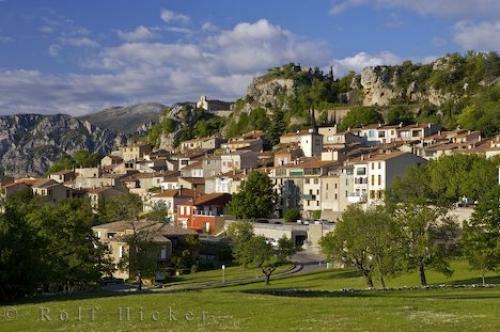 Village of Aiguines, Alpes due Haute, Provence, France, Europe. Photo of Aiguines village overlooking Lac de Sainte Croix in France.